Custom order handmade earrings. As always, when someone makes a request from me, I do not commit them to the purchase. Only if they like the final result do they then purchase it. But I do hope that they do like the final result. I can say, I love this result myself. There is always something so very stunning even with the simplest beaded bezel Rivoli. And Swarovski's Light Siam is definitely one of the most eye-catching, vibrant colors. As is my wont, I have included lots of photos. I often find that one can figure out a lot of the makeup of a piece if the photos are large and clear enough. So I hope these photos will be of help to you. And a visual record and reminder for me. Where available, you can click the smaller photos to view more details. 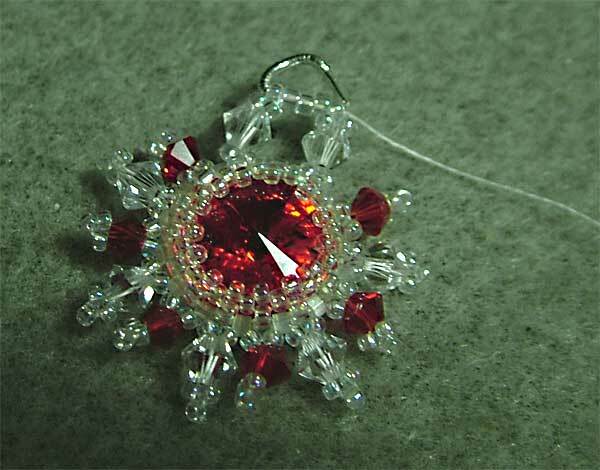 The Swarovski Rivoli (Light Siam) is absolutely stunning. It captures a whole depth of red, captivating in its saturation of reflected light and its change tones of vibrant reds. These visual work notes photos are sort of dark. Yes, again I was working through the night and though this time I cannot blame my mobile phone camera, I still cannot take clear, bright shots by night. However, as usual, I am including them because they will provide the needed details of the work process. 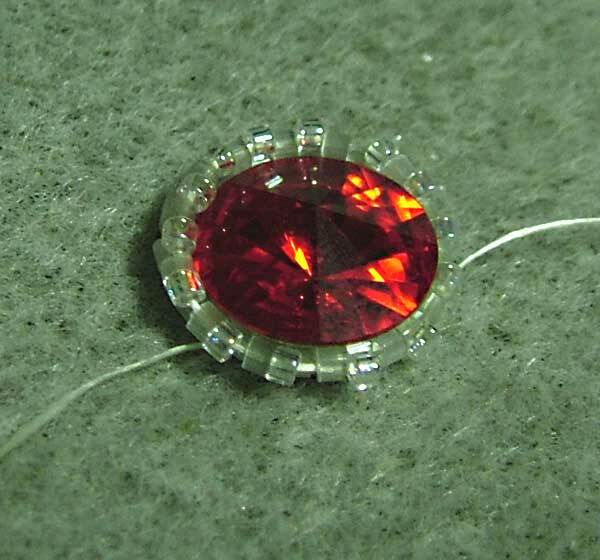 With the 12mm Swarovski Rivoli, I needed 28 delicas to make a ring round the rivoli. when you string the beads to get a good estimate of how many delicas you will need, get the circumference as close as possible but not larger than the circumference of the rivoli. Otherwise it will be not be a snug fit. 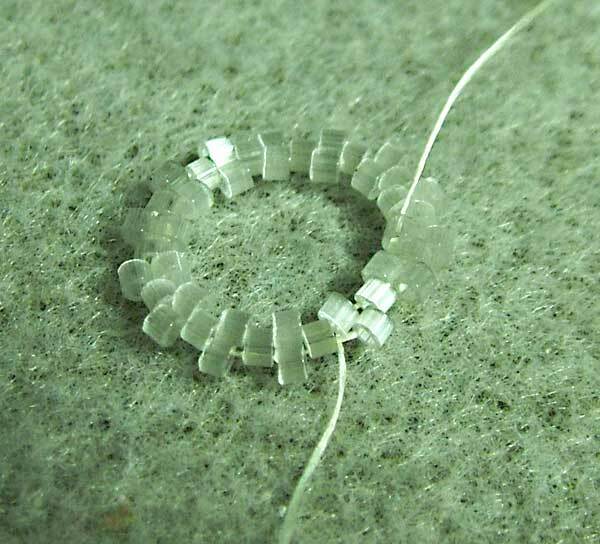 Once you have the correct number of beads strung, tie a knot to form the ring and thread through the first two beads strung for a firmer ring. Then you start the Peyote stitch. Note that I consider the pic above as 2 rows. For this 12mm sized rivoli, I only needed these 2 rows and then I started the "clinching" on the back by carrying on the peyote stitch using smaller 15/0 seed beads. (Just one row will do). 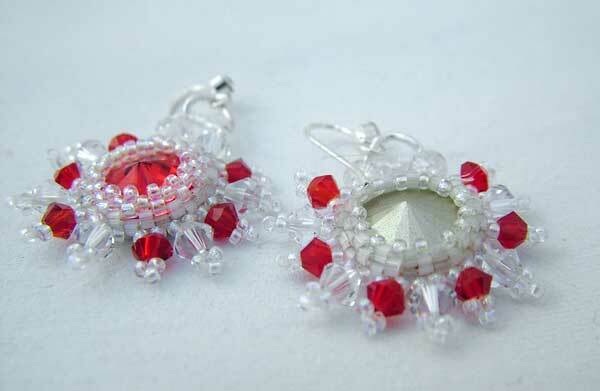 To clinch in and hold the rivoli - 2 rows of peyote with the smaller 15/0 seed beads. 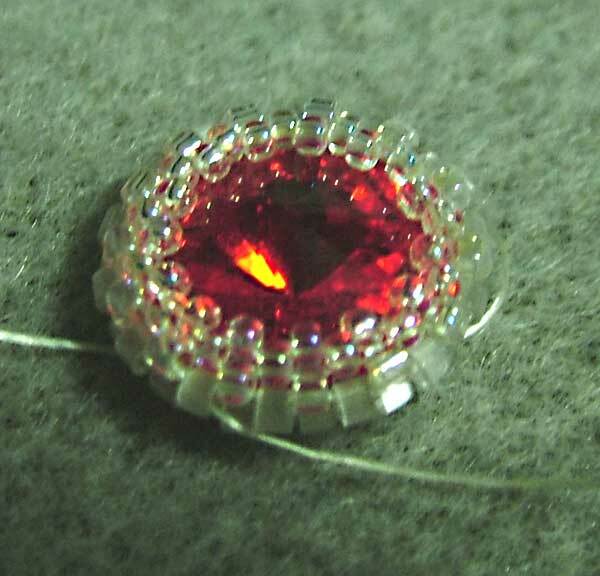 Weave thread back to a row along the rim of the beaded bezel, and start making the "stars" with 15/0 seed beads and 4mm bicone beads. 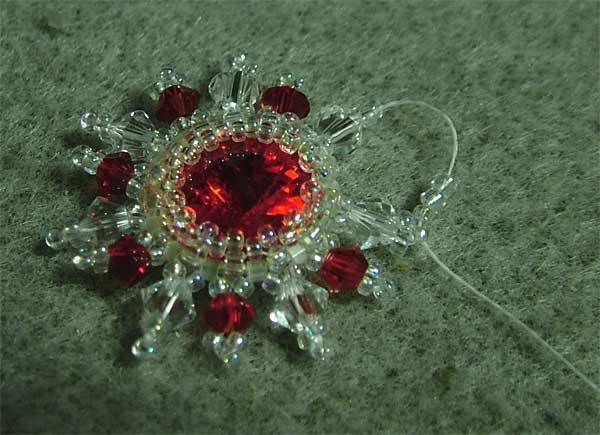 Join the last "star" to the first "star" with three 11/0 seed beads. 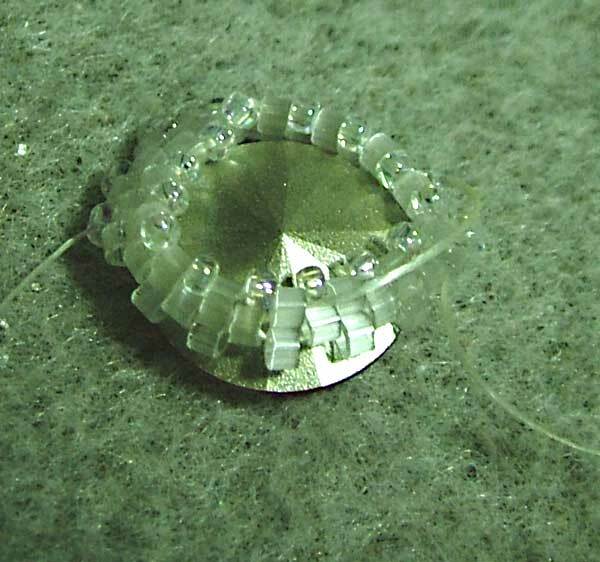 Then using (sterling silver) gimp/bullion, form a loop (from which you can later attach earring findings). 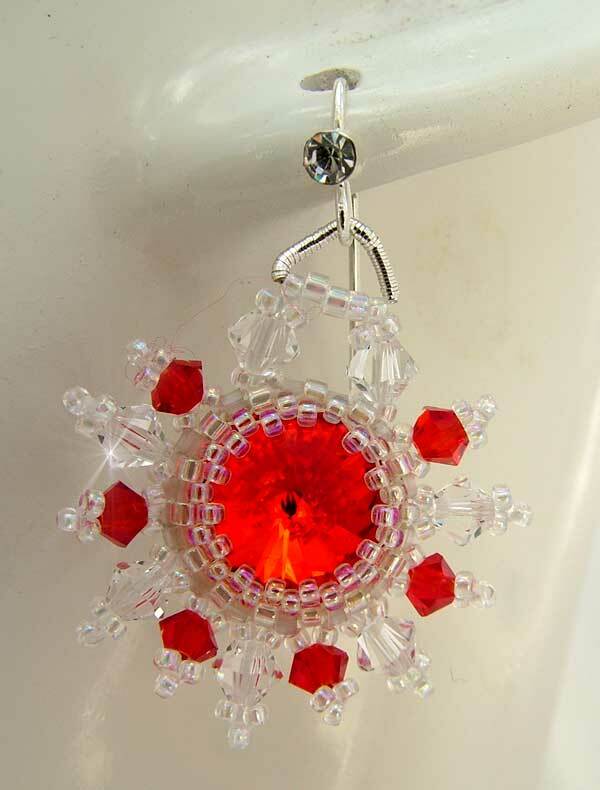 This last photo shows the front and back of the finished bead bezelled Rivoli for this handmade earrings. 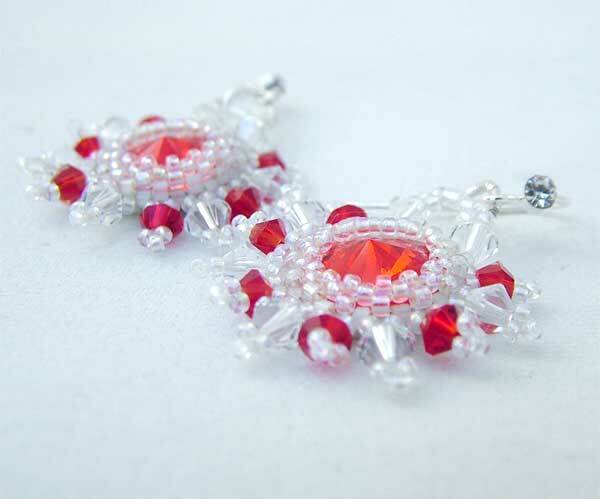 Hope you enjoyed this episode of "Red Sun" handmade earrings.